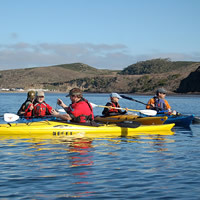 Intro to Kayaking: The emphasis in this class is on learning the technique that will enable you to paddle with maximum control and minimum effort. You will learn the body mechanics behind an efficient forward stroke and sweep strokes, and you will learn how to move your boat laterally. The high and low brace will be introduced. Safety, different types of kayaks and paddles, clothing, and equipment will be discussed. This class starts out at the Clavey store for the morning and moves down to the Petaluma River in the afternoon. 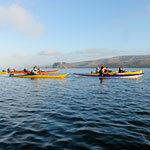 This class can be followed with Sea Kayaking I to further your kayaking skills. Special Offer: Each participant of this class will receive a Clavey Paddlesports Coupon valued at $30 to be used towards the purchase of a new kayak or paddleboard. Valid for up to 1 month from the date of class. Coupons cannot be combined and are non-transferable. My Husband and I took the beginning kayak class this last Sat . We wanted to say we thought she was great. She is really good at explaining and demonstrating techniques. My skills and confidence increased a lot in just that short time.